Title: 10/15/1986 - Target organ labeling requirements for shipped containers. This is in response to your letters dated July 10, August 7, September 2, and September 9, relating to the labeling provisions of the Hazard Communication Standard (HCS), 29 CFR 1910.1200, and relevant Occupational Safety and Health Administration (OSHA) interpretations and guidelines. ...cannot be implemented nor can OSHA fairly enforce these requirements unless a uniform, scientifically valid protocol is established that sets forth the level of evidence that would trigger an appropriate hazard warning. At the same time, you express the view that "... target organ health effect language should be placed on the label, where appropriate." You indicate that your organization is working with ANSI to develop a protocol. Finally, you seek a "stay" of any enforcement of target organ labeling pending the development and acceptance of such protocol. 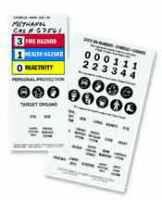 Safety Emporium has target organ labels to assist with your OSHA compliance needs. I want to assure you that I have given careful consideration to your arguments. My views are as follows. There is virtual consensus that the HCS is perhaps the most significant and far-reaching regulatory action ever taken by OSHA. A number of features contribute to the singular importance of the HCS. Among those features is the responsibility placed on the chemical producer to evaluate, on a continuing basis, the wide array of data and information that becomes available with respect to the hazards associated with the chemicals produced. It is then the producer's and each covered employer's responsibility to make determinations concerning how best to incorporate the evaluation results into an effective hazard communication program. While the basic elements of a hazard communication program are set forth in the HCS, the obligation for determining how to carry out the program rests with individual producers and employers, taking into account their particular needs and situations. It is precisely this performance orientation, which necessarily results in a relatively heavy responsibility being placed on chemical producers and employers to make difficult evaluations and judgments, that permits the HCS to be a flexible, dynamic standard, capable of keeping up with the ever-changing chemical work environment. It is also this performance quality that raises difficult compliance issues for employers and makes consistent enforcement particularly challenging for the agency. It is critical that OSHA, in implementing the HCS, strive to strike a balance between providing sufficient guidance to its compliance staff to establish a framework for consistent enforcement on the one hand, and providing overly restrictive compliance criteria or specifications that erode the performance nature of the standard, on the other hand. In our succession of instructions to our compliance staff on the HCS, OSHA has tried to maintain that balance. With respect to the particular issue you have raised, OSHA has consistently adhered to the basic principle in its compliance instructions that target organ labeling constitutes "appropriate" hazard warning for shipped containers. In expressing this principle, both formally and informally, since the promulgation of the HCS, OSHA believes that the balance between adequate enforcement guidance and maintenance of the performance nature of the standard has been preserved. I do not believe that attempting to provide a specific uniform protocol for determining the precise circumstances under which target organ effects should be placed on a label would be in keeping with OSHA's approach to implementing the standard. I therefore must deny your request for a "stay" of enforcement and for OSHA to develop specific guidelines. However, I am encouraged that your organization is working with ANSI in order to develop guidelines that will assist employers in determining when target organ labeling would be appropriate. OSHA would be pleased to review and comment on any draft protocol you may develop. It is this kind of industry initiative that the HCS was designed to inspire. Where industry takes the initiative to assist employers in their compliance efforts, OSHA will eagerly lend whatever support it can. In addition to the issue just addressed, your letter of September 2 questions the references used as part of OSHA's HCS evaluation system. In keeping with the performance nature of the standard, the standard's preamble stresses that a large amount of professional judgment must be employed in compliance activities relating to the Hazard Communication Standard. This position has also been emphasized by the agency in its guidelines issued since promulgation, and in OSHA training efforts. The Material Safety Data Sheets prepared by one source referred to in your letter are only one tool that OSHA professionals can draw upon when evaluating an employer's compliance with the provisions of the Hazard Communication Standard. In addition, the Agency relies heavily on several computerized bibliographic data bases including on-line Material Safety Data Sheet Systems and Area Office, Regional and National Office library holdings. Through these systems, OSHA accesses the same literature and research data as that available to employers and the public. I hope that this letter clarifies OSHA's position on the matters you have raised and offers a basis for cooperation as we move forward on the implementation of the HCS. Please feel free to contact me again if further assistance can be provided.